Loss of airway control in children, if not resolved quickly, will lead to devastating consequences. Successful management of the pediatric difficult airway, both anticipated and unanticipated, is facilitated by preprocedure assessment and preparation. Accessibility of and continued hands-on training with modern airway instruments, familiarization with difficult airway guidelines, and collaboration with multidisciplinary airway teams can aid in the management of the difficult pediatric airway. 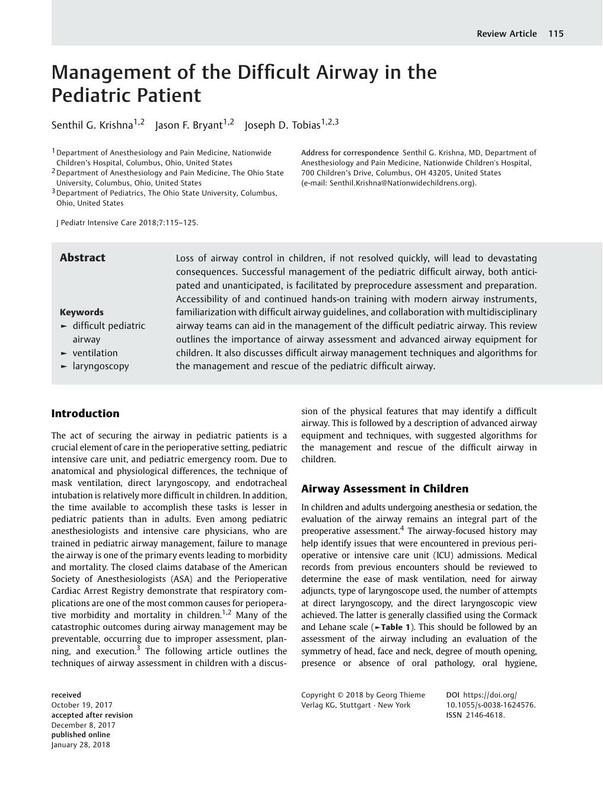 This review outlines the importance of airway assessment and advanced airway equipment for children. It also discusses difficult airway management techniques and algorithms for the management and rescue of the pediatric difficult airway.